It includes the new, remarkable, ReThink911-themed dvds, 9/11: Explosive Evidence – Experts Speak Out and 15-minute Solving the Mystery of WTC 7 with Ed Asner – both in color cardboard sleeves. 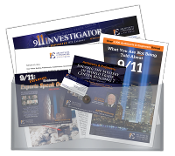 You also get the Street Brochure that lists evidence with photos, and our informative and colorful broadsheet newspaper, 9/11 Investigator, an introduction letter from AE911Truth, a one-page summary of our petition, and a business card. Each VIP Pack comes in a clear plastic envelope. Go out and get results!